This year’s celebration of Art’s Birthday will start with an afternoon tea party during which we will be preparing faxes to send to the village of Sauve in the south of France. Sauve is the birthplace of the originator of Art’s Birthday and the poet laureate of the Eternal Network, Robert Filliou. From January 14 to 17, Sauve will be the site of a large celebration of Art’s 1,000,031st Birthday. The dense program includes banquets in the local cafes, performances, video screenings, “Poesie Tout Terrain” and an exhibition of works by Filliou. A fax gallery will be set up to which everyone is invited to contribute an Art’s Birthday greeting. Join us at the Western Front, or send your contribution directly to Sauve at FAX NUMBER 011-33-66-77-00-99. This year’s Art’s Birthday, also known as Artist’s Day in Canada, coincides with two other events: the celebration of Martin Luther King Jr. Day and the first sitting of the new Parliament of Canada. During the last election campaign the issue of funding for the arts in Canada was all but absent from the debate. We plan to bring the importance of arts funding to Ottawa on this day. 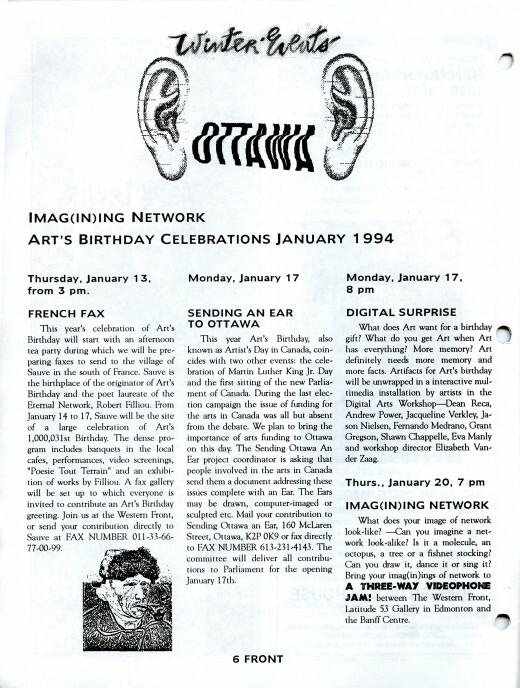 The Sending Ottawa an Ear project coordinator is asking that people involved in the arts in Canada send them a document addressing these issues complete with an Ear. The Ears may be drawn, computer-imaged or sculpted etc. Mail your contribution to Sending Ottawa an Ear, 160 McLaren Street, Ottawa, K2P 0K9 or fax directly to FAX NUMBER 613-231-4143. The committee will deliver all contributions to Parliament for the opening January 17th. What does Art want for a birthday gift? What do you get Art when Art has everything? More memory? Art definitely needs more memory and more facts. Artifacts for Art’s birthday will be unwrapped in an interactive multimedia installation by artists in the Digital Arts Workshop–Dean Reca, Andrew Power, Jacqueline Verkley, Jason Nielsen, Fernando Medrano, Grant Gregson, Shawn Chappelle, Eva Manly and workshop director Elizabeth Vander Zaag. What does your image of network look-like? –Can you imagine a network look-alike? Is it a molecule, an octopus, a tree or a fishnet stocking? Can you draw it, dance it or sing it? Bring your imag(in)ings of network to a three-way videophone jam between the Western Front, Latitude 53 Gallery in Edmonton and the Banff Centre.